Offline Storage Table simply called as OST file is a replica of Outlook elements like emails, contacts, notes, etc. stored on Microsoft Exchange Server. With the help of OST file, users can send, receive and delete emails in case of server down or no internet connectivity. And upon retrieving connection all changes or modifications made to OST file will be automatically synchronized with Microsoft Exchange Server. However, on the other hand user may face many problems of inaccessibility when OST file gets corrupt / damaged. In order to repair corrupt OST files, you need to convert exchange OST to PST file format. Hence you need to choose a right OST PST converter tool, which can convert your severely corrupt OST file without damaging it any further. Why do you need to convert OST file to PST? Which OST to PST File Converter Software to use? Remo OST to PST Converter application would be the best choice to use in this kind of situation. This extensive and reliable OST converter tool helps you to convert your corrupt, damaged, broken or inaccessible OST file into a valid PST file. The working of Microsoft OST to PST converter software is very simple such that even a novice computer operator can easily make use of it to convert OST file to PST file. This utility allows individuals to recover all deleted or lost Emails, Contacts, Calendar items, Journals, Attachments, Tasks, RSS subscriptions, Notes, etc. after converting their OST file into PST. 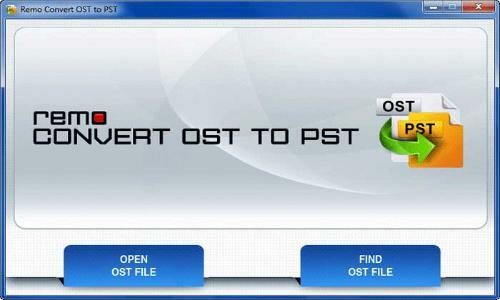 How to Convert OST to PST file with Remo OST to PST File Converter ? The conversion process is as easy as that, it is because of this easy to use interface. Remo OST file to PST Converter software is one of the most preferred and widely used conversion software on the internet. Click on this page and find a fabulous software to convert your inaccessible, corrupt, damaged OST file to readable Outlook PST file. Did you want toconvert your corrupt, inaccessible and damaged OST file to readable Outlook PST file in Outlook 2013? Then read this informative page. Want to convert OST file to PST in Outlook 2003? Then go for Remo OST to PST converter software. The advanced algo’s of this tool will quickly convert OST file into a healthy PST file. Refer the given link to read more about it. This page will guide you on how to fix Outlook 2010 OST file after receiving unable to expand folder error. Repair corrupt, damaged, oversized Microsoft Outlook OST file using Remo OST to PST Converter and restore both deleted / lost emails on all major versions of Windows operating system. Do you want to repair Outlook 2013 OST file? Then immediately go for Remo Convert OST to PST software. This tool is the best option to deal with Outlook 2013 OST corruption problem. Looking for perfect tool to restore deleted contacts from OST? Then definitely download Remo Convert OST to PST to recover all emails, contacts, journals, settings, etc. Follow this page and find an easy way to resolve your OST to PST conversion problem. Here you will gets a best tool to accomplish OST to PST conversion process. Repair your Corrupt OST file on Windows 7 by using Remo Convert OST to PST tool which will create new and healthy PST file. Remo Convert OST to PST file has the ability in repairing and converting corrupt OST file into new healthy PST file with simple mouse clicks. To learn how to repair 2013 OST file, just install and run Remo Convert OST to PST that explains the repairing process within few easy steps on Windows. Are you unable to repair corrupt OST File Outlook 2007? Then opt for Remo Convert OST to PST for fixing in few simple steps. Export all important your data from OST to PST exchange 2010 easily with the help of Remo OST to PST converter utility, an optimum tool with user friendly interface. Corrupted OST file on Outlook 2013 can be converted into healthy PST file making all data accessible using powerful OST to PST converter i.e. Remo Convert OST to PST. To convert offline OST to PST file on your computer make use of Remo OST to PST converter app, this is an awesome tool which does the conversion task very efficiently. Easily convert OST to PST exchange 2010 by making use of Remo OST 2 PST Converter just in few simple clicks on all Windows computer. Convert large sized Outlook OST file to the PST in few clicks. Employ Remo OST to PST Converter application, which is one of the best converter tools. Want to convert OST file of Exchange 2007 to PST file? Then, employ Remo OST to PST Converter app. It’ll perfectly convert your OST file to PST and exports entire data to it. Here comes the all in one OST 2 PST converter tool known as Remo Convert OST to PST, which can convert your healthy as well as damaged OST file to PST file format instantly and effectively. Secure conversion of exchange 2013 OST file to PST format can be carried out within a fraction of minutes using Remo OST to PST converter. If your OST file is in use and cannot be accessed somehow, then you can opt for Remo Convert OST to PST tool, which can easily fix issues by converting OST file to PST within no time. Easily convert exchange OST file to importable PST format with all objects using Remo Convert OST to PST tool just within a matter of minutes. Recovering Outlook OST contacts just by converting OST to PST file with Remo Convert OST to PST tool, which performs its task with just few mouse clicks. Remo Convert OST to PST software helps Outlook users to safely convert the corrupt .ost files to healthy .pst files with access to all its attributes like emails, notes, tasks, RSS subscriptions, etc. An OST file can get corrupted for various reasons. In this article, you’ll learn reasons for OST file corruption and also how to convert them to PST file using different methods. Here is the step by step procedure to recreate OST file in Outlook 2016. If you want to repair damaged OST file, then use Remo OST to PST converter tool.